Teodoro Melendez and Family share the natural beauty of sodalite, gem of peace and harmony, with the design of these earrings. 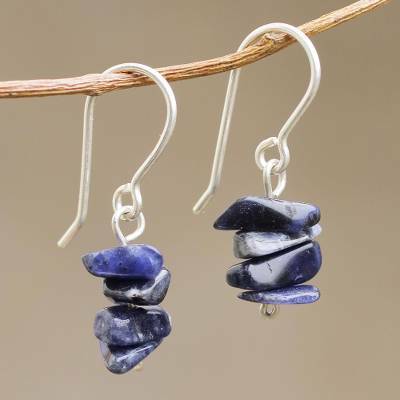 The earrings are crafted by hand with chip-cut sodalite, and they are worn on sterling silver hooks. You can find sodalite beaded earrings 'Nature's Harmony' by Teodoro Melendez and Family in jewelry categories such as Bohemian Earrings, Sodalite Earrings, Silver Earrings, Sterling Silver Earrings, Beaded Earrings and Dangle Earrings. Enjoy exploring these sections for other Novica treasures. Beautiful Sodalite earrings. I waer them often and have had compliments on them. 5 stars!! These are the perfect size and are high quality. The wires are not thin wires but real silver. Because of the subtle natural variations in blue colors, these compliment all my outfits with any blue in them. Love these! The earrings are pretty, but stones are more dull than pictured. They are a nice size. Sodalite is my favorite stone !! I have looked and looked and finally found these and now they are my favorite earrings to wear. Perfect size. Not heavy. Work well with casual outfits, especially jeans.